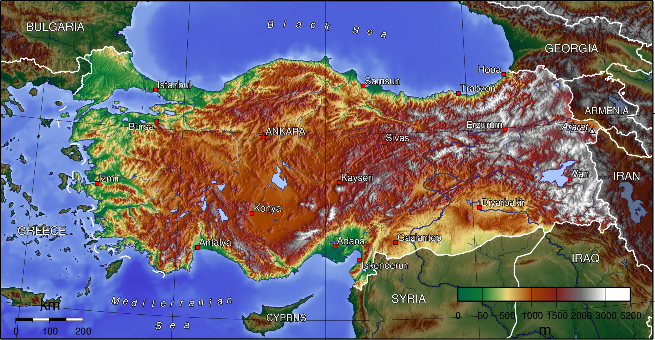 Most of us might have heard something about the Geo-strategic position of Turkey. She connects two continents to each other and provides a bridge between the relatively advanced Europe and the resource-rich Middle East. It is also a well known fact that Hitler attacked the Soviets to gain access to the Caucasian oil fields, in addition to his other designs. Given that, why did Hitler not order the attack of Turkey in order to reach the oil in the Middle East? He would also have struck a mighty blow against the Allies, since most of that area was under Allied control then. Additionally, he could have seized control of the Straits which are vital for Black Sea region, putting additional pressure on Stalin. Turkey, like Spain and Sweden, was a country that "served the purpose" for Germany during World War II without being attacked. Specifically, Turkey was a major supplier of chrome, a key war material, both in her own right, and through "transshipments" from modern Rhodesia and South Africa. A hostile Turkey might not have been as good a supplier of such materials. Turkey would also have been a tough nut to crack militarily, given her hilly terrain (difficult tank country), and martial traditions, most recently displayed in World War I with a defeat of a British invasion of Gallipoli. Given the limitations of the German advance in Russia in 1941, if they had continued from the Balkans into Turkey, that might be all that they would have gotten that year, giving Russia (who was rapidly re-arming and fortifying her frontiers) another year to prepare for war. Finally, Turkey had been an ally of Germany in World War I, and Germany had some hopes of winning her over, e.g. through a successful campaign in Russia, as she had with Hungary, Bulgaria, and Italy, her other World War I allies. As in the case of Spain and Sweden, Germany felt her interests were better served by Turkey as a benevolent "neutral," as opposed to an outright enemy. I've had similar questions over the years, and did some research on this. Let me admit, though, my interest comes from a different angle. I was originally thinking why didn't the USSR invade Turkey somewhere around 1939 - 1941? But I will try to answer your question about why Germany didn't do it. As you can see, it's very mountainous. In that respect, it's similar to Afghanistan. A war here would be very different from the war in flat East Europe. That does not mean it's impossible, but it would take a lot longer than normal. Population of Turkey in 1940: 17.8 million. From this we can estimate that the number of males aged 15 to 35 is about 2.37 million. From the mountainous regions, you would think logistics would be a nightmare too. However, the immediate question is, were there any railways in Turkey around 1940? And the answer is yes. I found a great site, trainsofturkey.com, that has a lot of historical info on this. This is actually not too bad. If you can blockade the coasts and use the pink railway, you could surround practically the whole country. Dark Red lines I confirmed existed by 1941. Bright Red lines I could not confirm exist by 1941. Even so, you can see that there is a decent network of railways throughout most of Turkey. Unfortunately, I could not find any data about which lines, if any, were double-track (2 lanes dedicated for 2 directions). I could not find what gauge these railways are, but I think they're almost certainly the "Standard Gauge" (1435 mm) used by Britain, France, Germany, and many other places. But probably, the tan line in the northeast is Russian Gauge (1524 mm). The point of those rail maps is to show that, theoretically, logistics is not as bad as it might seem from the topological map. This is of course contigent on having access to those railways, the rolling stock, and not being interfered with by the British Navy, for example. We'll get to those again soon. We also need to know the state of Turkey's military at this time. For this I rely on Wikipedia's Military History of Turkey. It does not appear comparable to Germany's military, nor to Russia's military for that matter. Finally, we need to know Turkey's economic role in the war. AFAIK, the only economic product of importance was Chromium. Chrome is an important alloy for stainless steel. Without it, your steel would rust. I could not find maps of historical chrome mines in Turkey, so I don't know exactly where those mines were located. Invade Thrace (European Turkey, west of the Bosphorus) to set up airbases and control the Bosphorus Strait. Blockade and bombard the coastal cities and towns. This would require sea power, which Germany didn't have in this part of the world. Britain had almost all the sea power in the European Theater, and note that Cyprus has a major British Naval Base right next door. Alternatively, use air power to bomb the coastal cities/towns and ports. This is no small matter. Assuming your airbases are only in Greece, Bulgaria, and Crete, the distances involved probably mean that only the west half of the coast is feasible to bomb. Anyway, somehow clear a beachead and get access to at least one railway, I would guess at Istanbul or Samsum. Then import rolling stock to move your army into the interior. If Germany could get access to a railway, this is feasible. Germany could certainly produce its own rolling stock (train engines, train cars, etc. ), and there appears to be a rail connection to Istanbul from Greece or Bulgaria. Fight your way in along the railways. Set up army bases and airbases along the railways. Even if the railways are one lane only, I believe this is feasible. I'm pretty sure the Russian Civil War, at least, saw some heavy fighting on single-lane tracks with armored train cars. Another matter is sabatoge (blowing up tracks or trains). From what I've read, however, track can be repaired in less than a day when you're prepared for it (bring repair equipment on your train), and clearing a wreck takes maybe a day too. I believe Russian practice in WW2 was to put a dummy car at the front of a train to take the brunt of any mines anyway. Preferably, invade the valleys around Adana and Iskendrun to get access to the relatively flat lands on the Syrian Border. This will cut off access routes. Remember, Syria became part of Vichy France but then was retaken by the allies in summer of 1941, along with Iraq right before it. So why didn't Germany do this? In some sense, they were alreadying trying to access the Middle East or Transcaucasus, but through Africa, presumably because the terrain was easier. Turkey was a neutral supplier of Chrome and historically had good relations with Germany (like in WW1). Keep in mind that Spain, Portugal, and Sweden were also neutral suppliers of critical materials. If Germany invaded Turkey, those others would get pretty nervous and may have more incentive to join the Allies. Something else to note: The Molotov-Ribbentropt Pact agreed that the USSR would annex all of Finland, even though Finland had important nickel mines. This shows that Germany was willing to allow important resources in future enemy hands, so by that reasoning, they should be perfectly willig to allow important resources in neutral hands too. Russia was the bigger threat---much, much bigger---and conquering it would give Germany a lot more than Chrome. In fact, we should look at the order of conquest that Hitler did, or tried to do: Poland, Denmark and Norway, France and Benelux, Britain, Southeast Europe, Russia, The End. Most of those were real threats. Turkey was not a threat. If Germany invaded Turkey, Britain would almost certainly ship in war supplies. Turkey would almost certainly allow British troops to come and help them defend. This would probably include aircraft too, and the Battle of Britain and the Blitz were aerial defeats of the Luftwaffe by the Royal Air Force. Britain' Navy would almost certainly secure most of the coast, with the exception of the Black Sea. Britain could resupply Turkey indefinitely as long as Convoys kept coming from America and Canada. When Germany conquered the Balkan Peninsula, it was a very bloody victory. The British were helping Greece at the time, ensuring large casualties for the Germans. They could expect more of the same if they tried it in Turkey. When USSR invaded Finland in 1939, they did not succeed. This made Finland lean towards the Axis, and they allowed Nazi troops into Finland. Hitler probably did not want to risk such a thing happening in reverse in Turkey. So to sum up: Invading Turkey could only be realistically considered if Germany could somehow do it "one at a time" like they did with Czechoslovakia and Poland. Even then it would have cost a lot of casualities and time. By 1940, the gig was up and Britain was at war with Germany. The bigger threat was Russia, and Hitler actually believed Russia would die by the end of 1941, giving him access to oil in the transcaucasus. No need to go after non-threats unless somehow you knew they were about to side with the allies. Turkey was pretty committed to neutrality, and German intelligence probably knew this. Disclaimer: I am not an expert in war or geopolitics. But I have read a lot about Germany and Russia in WW2, and their decision-making. Reaching the Middle eastern Oilfields which are on the Persian Gulf is a lot harder than it looks, and getting the Oil back even harder. The railways don't go all the way and the Turkish railways were pretty low volume. Shipping just forget that the Axis dint have the tankers and RN would just sink them (too many bases not enough escorts). To rail the Oil back to Germany, the problems are no rails and the years it would take to build them, and the lack of rolling stock and the years it would take it build them. Going for the middle eastern oil would require years of investment before any return would be realised. Berlin Moscow 1836km, Berlin Stalingrad 2783km, Berlin to Baku 3066km, Berlin Basrah 3709km. The Logistics are much more difficult than first appears. Hitler wasn't interested in Turkey in itself, but let's analyse this option as a means to an end. Hitler went to war as he wanted "Lebensraum" for his people, literally, "living room" and for that he needed Russia, specifically the Ukraine and European Russia. Turkey did not offer this, it's a difficult country to move around with poor (at the time) infrastructure and logistics. However, it could offer some options for getting to the Middle East and the oil rich Caucuses. The trouble is that with the relatively strong (compared to Greece and Yugoslavia) Turkish armed forces, coupled with poor road and rail links, it would have taken the Germans a long time and a lot of their firepower to prevail. This would have given the Russians more time to modernise and prepare for the inevitable German invasion so it was never a viable option, although I am sure Hitler would have considered it. If you look at it on a cost to benefit analysis then it's simply not worthwhile. Also Germany wasn't having problems with oil at this stage of the war (1940-1941), shortages only became a pressing issue from 1942 onwards and not critical until 1943 or even 1944. Once the invasion of Russia had been launched Germany didn't have the chance or the forces spare to invade anyone else, they had their hands full! In my opinion an invasion of Turkey would have put Barbarossa back until 1942 at least and tied down a lot of German forces after that as there would have likely been a lot of partisan/guerilla forces continuing to fight even after Turkey officially surrendered. Invading Russia in 1942 would have been harder than in 1941 with all those extra T-34s for a start! Had Hitler's plan to conquer both the Caucasus (part of Operation Barbarossa) and British-occupied Palestine (through Rommel) worked, Germany's intent was to link up both forces through Turkey. If Turkey would not have given its consent to German troop movements across its territory, then probably Germany would have attacked Turkey. Both German campaigns failed however; the Caucasus wasn't conquered and Rommel was stopped by the British at El Alamein. 2 Reasons: 1. Had to do with the early attitude of the Nazis towards moving the German Jews to Palestina. A friendly Turkey would serve the purpose as a large guardian state to keep Palestina in check. 2. Turkey was a muslim state and Hitler sought to galvanize the muslim world against the Jews - the Grand Mufti of Jerusalem would become one of Hitler's greatest allies in the region. There is also a third, unconfirmed reason: Hitler, having been a soldier in WW1, still saw Turkey as a potential ally as they had been previously. But since the Turkish army was pretty much in a useless state, he abandoned the ally-idea swiftly into the war and maintained only his own fond memories. By the time he would have considered invading Turkey as the Italians were useless, he had already become too entangled in the Soviet Union. I don't mean to contradict any of the existing answers to this question or to offer a comprehensive answer myself. Military and logistical issues would have certainly been factors, just like the Italians' failures in Greece and the Balkans and Germany's need to devote resources to those areas to back up the Italian troops. But I think Hitler's own personal interest in Kemal Ataturk is important to consider. Maybe it's not a bad analogy to say that Hitler considered Ataturk a sort of Turkish kindred spirit in that he wanted to reform and modernize his own nation, once a formerly great empire that had recently been defeated and minimized, rebuilding it in his own image. This is basically what Hitler was attempting in Germany. One reason the Germans didn't try to go through Turkey could be Hitler's interest in Ataturk. An interesting fact was that Turkey actually proposed a tripartite alliance against German expansin at Balkans between Turkey, the USSR and Britain. They proposed to attack Germany in case they invaded Romania. But after Molotov-Ribbentrop pact was concluded such alliance became infeasible. The British proposed Turkey to make a bilateral treaty but Turkey replied that without USSR such alliance is worthless. Germany on the other hand strived to win Turkey in their alliance and exerted considerable pressure on her. For instance, they refused to ship the weapons purchased by Turkey from German plants and to return the paid money. As a result, Turkey was quite outraged, and the British shipped similar weapons to Turkey for free. As a turkish man from turkey which grown up with history I can say Turks admires Germany all the time in history. Even when they were ottoman. Many commanders educated in germany before and during WWI. Teachers taught us some commanders in Turkish army known as German fans. In my opinion this situation did not changed at WWII. Ismet Inonu (prime minister during wwII) known as German fan too. Maybe Hitler and Inonu think they were natural allies. Apparently the German army made plans (or considered trying) to at least base armies in Anatolia (roughly Asian Turkey) and move into the Middle East. However, the idea was to do so after Russia was defeated, and we know how well that went. The purpose was to (some extent) get Iranian oil, but more importantly to harass the British Empire where it was accessible from land. (A previous move in this direction was made earlier, when there was a German-inspired revolt in British Iraq and an attempt to hold Vichy Syria for the Reich, but these both failed). I can't tell if the German army would be 'allowed' into Turkey or just would move there. Here's a quote, from The Wages of Destruction, the Making and Breaking of the Nazi Economy (Adam Tooze), p. 441. The simple answer is that while Hitler had some talents in public speaking and human manipulation, he was not very bright. There is overwhelming evidence that shows he underestimated Russian military capabilities and thought it would be easy to get to the oil fields in Baku. If he would have known it was going to be nearly as difficult as it was I am sure he and his military planners would have chosen to invaded Turkey for the simple reasons that once Turkey was conquered Baku would be in immediate striking distance over the Turkish border, air support and supplies lines would be much closer and invading Turkey could have been done without directly provoke Russia until he was finally ready to strike out toward Baku. I think it is with the benefit of history that many tacticians would see Turkey as the best choice today. History also shows that no agreement or pact was responsible for Hitler's failure to invade Turkey because Hitler did not care about these: he had one with Russia and what happened? The evidence that Hitler was not bright and delusional is clear when you look at the contradictions in his own "aryan" measures. There is considerable evidence that Slavs are descendants of viking traders that created trade routes into the western Russian river networks. The circumstantial evidence this is true is literally written all over the faces of vast numbers of Russians and other Slavs: Many are blonde haired and blue eyed. I think the bizarre thing about Hitler's ethnics opinions is that the Slavs, who have large numbers of people that fit Hitler's Aryan physical guidelines, were considered inferior and not Aryan, but dark complexioned people like those in southern Italy (who have Africa Moor blood in them) ARE Aryan. This is just one example of how Hitler's thinking was illogical even for a bigot. It seems pretty clear that if Hitler was smart enough to see that Slavs are the same degree away from his perfect Aryan and a German is and he would have allowed the Ukrainians (especially) to have their own country (under gentle German control, similar to Norway) that the Ukrainian would have fought with Germany against Russia and Germany would had a significantly increased chance of defeating Russia. Hell, if Stalin was in Hitler's place he would have given Ukraine independence, had them help him beat Stalin, THEN killed all the Ukrainian and took their land. This shows Hitler was not even good at treachery! There is so much wrong with the above post: Russian did not invade Finland because it was a tradition to do so. They did it because they were interested in the nickel rich area they eventually took over. Also, Finnish is in the "Urgic" language branch with Hungarian, so is not a single unrelated language like Basque. Hitler invaded the Ukraine instead of Spain not only because it has been known for centuries as some of the most coveted and rich farm land in Europe, but also because it was relatively sparsely inhabited, vast, and uniquely unexploited/uncultivated. The Nazis spent too long fighting the slaves who proved to be alot stronger than the Germans anticipated. Theres doubt they would have made it to turkey through battle hardened Yugoslavia. The German forces had to retreat to no avail, realizing that if they didnt get up to Russia that winter would set in. Eventually its the winter that beat them after the Russians drew them deep into Russia. The Russians burned their villages leaving no food or shelter to seek refuge in. After heavy German losses, the nazis had to head back out of Russia and they were slowly picked one by one by small Russian patrols until only a handful of German made it out. The Russian lost 20 million! Hitler actually wanted his generals to attack and capture Turkey but his generals changed his mind. They could capture Istanbul but that's it...if German army entered Anatolia, they would be annihilated in a matter of weeks. Turks proved how they fight by beating England and France in Dardanelles. after 8 months of fierce fighting, Brits had to run away leaving 125.000 dead soldiers behind. Not the answer you're looking for? Browse other questions tagged world-war-two nazi-germany turkey or ask your own question. Why did Hitler not concentrate more on North Africa? Why didn't Germany attack US ports with U-boats during WW II?